Christ Reformation Church is located in Tillamook, Oregon on the Oregon coast about 60 miles west of Portland. Our building is in a rural area north of the town, not far from the Tillamook Cheese Factory. The church was originally founded as Idaville Bible Church, dispensational in theology, but in the early 2000’s the name was changed to Christ Reformation Church to reflect the fact that we embraced Reformed theology as our doctrine. Pastor Jeff Crippen and his wife Verla came here in 1993. Prior to this, the church had changed pastors an average of every three years. As you can read in our blog series How a Local Church Becomes Enslaved to Evil, the church looked great from the outside, but it soon became apparent that the majority of the members were unsaved and in fact very much opposed to the truths of God’s Word. Years of conflict ensued and when the smoke cleared, about 30 people remained. That is the size of our local congregation now. Throughout these turbulent years, the Lord was at work teaching us not only the wonderful truths of His kingdom, but also making us wise about evil. 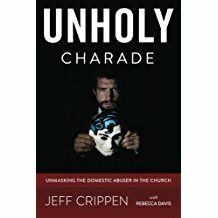 As most of you know, one major result of these battles was the establishment of our book writing (Unholy Charade: Unmasking the Domestic Abuser in the Church* and A Cry for Justice: How the Evil of Domestic Abuse Hides in Your Church*) and blog ministry, Unholy Charade. We work to expose evil in local churches, specifically domestic abusers who are parading as fine Christians. We also work to encourage and help victims of abuse learn about what is happening to them and how they can be free. Our online blogs and sermon broadcasts have extended our congregation far beyond the small group here in Tillamook and we are working to enable these fellow believers to be a real part of Christ Reformation Church. This blog, Light for Dark Times, is the central place where our brothers and sisters in Christ can plug in with us and really be part of this church. *Amazon affiliate associate. See more information here.